PHOTO: National Woman’s Party protesters gathering at the Lafayette Monument earlier today. 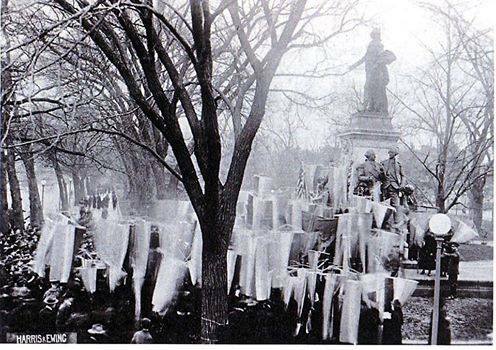 December 16, 1918: A spectacular procession, followed by a stunning protest in favor of woman suffrage, took place this afternoon at the Lafayette Monument in Washington, D.C. The reason for the demonstration – held on the anniversary of the Boston Tea Party in 1773 – was to call attention to the fact that President Wilson arrived in France today to help promote democracy overseas, while the job of winning it for the women of his own country remains undone. It’s Wilson’s own Democratic Party that is failing to provide its share of the votes needed in the Senate to pass the Susan B. Anthony (nationwide woman suffrage) Amendment. It passed the House in January by a margin of 274-136, just enough for the required 2/3 majority, with 83.3% of Republicans voting in favor, and just 50.5% of Democrats in support. It now needs only the same 2/3 majority in the Senate to be sent to the States for ratification, and two votes are currently lacking. Today’s pageant began when three hundred members of the National Woman’s Party, some carrying purple, white and gold party banners, and other carrying torches, formed up in front of National Woman’s Party headquarters. Led by Anna Kelton Wiley, carrying an American flag, suffragists representing 31 States marched past the White House and on to the Lafayette Monument. “We hold this meeting to protest against the denial of liberty to American women. All over the world today we see surging and sweeping irresistibly on, the great tide of democracy, and women should be derelict to their duty if they did not see to it that it brings freedom to the women of this land. “England has enfranchised her women, Canada has enfranchised her women. Russia has enfranchised her women, the liberated nations of Central Europe are enfranchising their women. America must live up to her pretensions of democracy ! “Our ceremony today is planned to call attention to the fact that President Wilson has gone abroad to establish democracy in foreign lands while he has failed to establish democracy at home. We burn his words on liberty today, not in malice or in anger, but in a spirit of reverence for truth. “It is because we are moved by a passion for democracy that we are here to protest against the President’s forsaking the cause of freedom in America and appearing as a champion of freedom in the Old World. We burn with shame and indignation that President Wilson should appear before the representatives of nations who have enfranchised their women, as chief spokesman for the right of self-government while American women are denied that right. We are held up to ridicule to the whole world. “We consign to the flames the words of the President which have inspired women of other nations to strive for their freedom while the author refuses to do what lies in his power to do to liberate the women of his own country. Meekly to submit to this dishonor to the nation would be treason to mankind. Presidential speeches and statements do not by themselves enfranchise any women. Using the full power of the Presidency to lobby reluctant Senators of his own party to get the two more votes needed to pass the Anthony Amendment and send it to the States would be a concrete and major step toward enfranchising millions of women. While the National American Woman Suffrage Association continues to work and lobby in traditional ways, the National Woman’s Party will continue to engage in these militant actions until Wilson’s words are turned into deeds. If both organizations keep up maximum pressure, their mutual goal of nationwide woman suffrage can be achieved. The only question is whether the Anthony Amendment will be passed by this Congress or the next, and whether 36 of the 48 States can ratify before nationwide elections on November 2, 1920.